Do You Need To Be a Certified Resume Writer (CRW/CPRW)? CPRW. NCRW. CMRW. CARW. ACRW. When you look at the certifications after some resume writer’s names, you start to wonder what the heck they all stand for, do you need one, and, if you do need one, which ones are the most important in order to A) impress your clients and B) be considered a professional within your chosen industry. This is especially true if you’re new to resume writing and looking for that first certification. Which organization is the best? Which offers the most ‘bang’ for the buck? You might even be wondering if you need resume writing certifications. After all, people were writing resumes for decades before certifications became the norm in the industry, so why all the hoopla about being certified? Here, I will answer resume certification questions for you, plus provide specific information on the various certifications available to resume writers today. By the time you’ve finished reading, you’ll have the information you need in order to make an informed decision about which, if any, certification is right for you. Why Do You Need to Become a Certified Resume Writer? I know this can be controversial for anyone reading this who aggressively pursues resume certifications. Though I bet that you’ve seen poor quality resumes written by certified resume writers, right? In short, certifications alone don’t guarantee to resume writing quality. There are plenty of excellent resume writers out there who deliver a product just as good – and sometimes better – than certified resume writers. After all, writing a resume is just like any other kind of writing. If you are good at what you do and continue to hone your craft, you’ll eventually become a great resume writer, and subsequently, succeed. There are no certifications for fiction writing, technical writing, medical journal writing, etc. (Although you can get academic degrees in those, and other, areas.) Plenty of people writes for a living without a certification or a degree. Resume writing certifications can be a sizable investment, depending upon the resume writing organization you join. For example, training company Resume Writing Academy (RWA) costs $1800+ to acquire the ACRW certification. However, it doesn’t hurt to become certified. Why? 1. Training = Greater Skill. No matter what your field – writing, teaching, construction, driving a big rig, or taking care of animals – the more training and education you have in your chosen job, the better you will be at it. Remember the old adage, ‘Practice makes perfect?’ Well, you can add ‘Training builds skills’ to that concept. Certification programs will teach you the ‘tricks of the trade,’ give you examples of resumes that work and don’t work, and demonstrate how to obtain the right information from your clients. 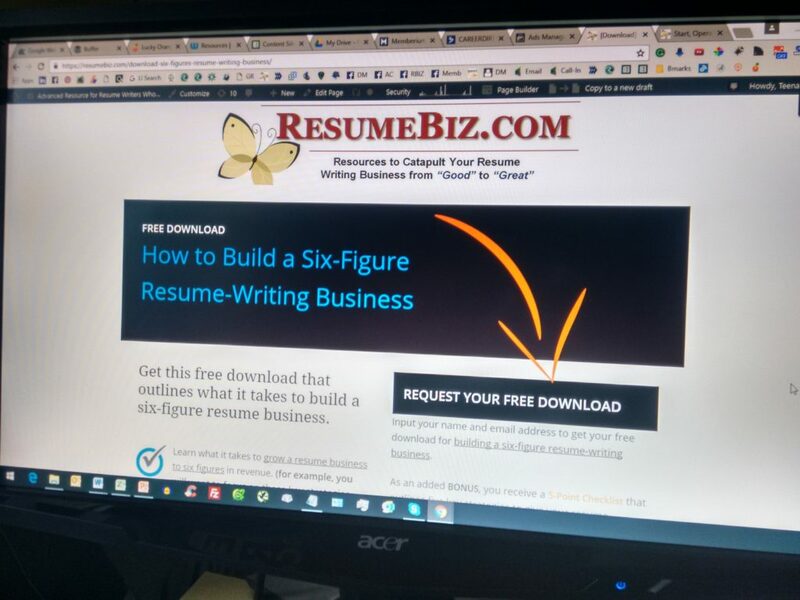 The field of resume writing is very competitive, and customers are looking to get as much value as they can for their dollar. So they’re doing their homework, not only about individual writers but also the industry in general. A lot of them are aware of certifications and want their writers to have one. Let’s face it. If you’re interested in writing an article for the local paper or giving a presentation at the local Chamber of Commerce meeting or library, it looks better to have professional credentials. Think about it – if an organization wants to have someone come in and give a lecture on resume writing, won’t they be more likely to hire someone who is ‘Certified’ rather than someone who isn’t? Having a professional designation automatically means you sound qualified at what you do. Now that you know there are good reasons for getting a certification, it’s time to begin thinking about which one to get. At last count, there were more than 10 main certifications a resume writer could obtain. This section will provide details on the Top 3 certifying agencies and the specific resume writing certifications that they offer. The PARW/CC is the oldest credentialing organization for resume writers, founded in 1990. Prior to their formation, there were no associations for resumes writers or career professionals. The organization was formed to achieve several purposes, the most important of which was to set quality standards in resume writing and to help resume writers share information about their craft. Today it is the most widely-held certification among resume writers and (depending on who you talk to) either the Number One or one of the Top Two most respected designations a writer can hold. There is a study guide that applicants have several days to learn, and the final part of the exam involves creating a resume and cover letter from a mock client’s raw data. The examination is timed, and the applicant can obtain and return the test via email or fax. Tests and sample resumes are reviewed by a team of industry professionals, and then a grade issued. The price of the study guide and examinations is $225, and applicants must demonstrate basic skills in resume writing before being approved to take the examination. To date, no sample CPRW test is available to the public. Because the CPRW is both the most recognized designation in the industry and possibly the most highly regarded, more resume writers pursue this certification than any other. This is both a good and bad situation for new CPRWs because it means having a true industry-standard designation but it also means not standing out from the crowd anymore. Formed originally as an offshoot of the Professional Association of Resume Writers (the Northeast Resume Writers Association), it evolved into the NRWA in 1997 and today boasts more than 400 members. Individuals wishing to obtain an NCRW designation are required to take an examination that covers resume writing, cover letter composition, proofreading, and electronic resume preparation. Unlike the CPRW designation, before taking the exam a prospective writer must first obtain 10 continuing education units (CEUs). These can include outside courses, attending conferences, and performing self-study. Once received, the NCRW is valid for 3 years. Retaining the certification is based on continuous membership in the NRWA and obtaining 15 CEUs during each 3-year period. The price to take the certification test is $140, plus a $50 fee for submitting samples for evaluation. This is in addition to whatever membership fees the organization charges and the costs of CEUs. While the NCRW program doesn’t offer anything that isn’t included in the CPRW designation, the NRWA’s policy of requiring continuing education throughout the writer’s career does tend to provide some impetus for keeping up-to-date on the latest trends. On the other hand, some would object to the cost this involves and say a true professional will always keep abreast of changes in their industry and licensing shouldn’t depend on how many conferences are attended during a 3-year period. The newest of the resume writing organizations, the Resume Writing Academy was founded by two resume writing professionals with extensive credentials, Wendy S. Enelow and Louise M. Kursmark. It is the only organization devoted entirely to providing advanced education to help professionals become certified resume writers. The program is much more intense than the other credentials, with a combination of classroom (in person or self-study), training assignments, independent learning projects, and examinations. Included with resume and cover letter preparation, the program also covers grammar, client positioning, and more. Part I includes 8 teleseminar classes plus weekly homework. As might be expected for a program billing itself as the most extensive resume-writing credentialing program, the price is higher than any of the others. Registration for the Resume Writing Academy is $1,895 (formerly $2,295) and includes all training sessions, course materials, audio recordings and more. Various organizations offer other certifications for individuals looking to move beyond resume writing and into other areas of career and job search assistance. This organization offers two non-resume writing certifications: the Certified Employment Interview Professional (CEIP) and the Certified Professional Career Coach (CPCC). The CEIP involves specialized training in how to prepare clients for employment interviews. CEIPs assist their clients with interview training, question/response preparation, and making a positive impression during the interview. As the title states, the CPCC is for professionals who focus on identifying life goals, ambitions, and career options for their clients, and then crafting customized career and job search strategies to help their clients achieve those goals. CPCCs are in demand to assist employed and unemployed individuals, recent college graduates, and people looking to pursue a career change. This organization offers three different credentials: Associate Certified Coach (ACC), Professional Certified Coach (PCC), and Master Certified Coach (MCC). This organization offers the Certified Professional Co-Active Coach designation. In order to achieve a CPCC, coaches must complete a multi-course core curriculum and then a 6-month certification program. The CCI offers the designation of Certified Career Coach (CCC). This program involves a series of study exercises, tests, e-based classes, practice coaching sessions, and a final examination. The CCI also offers the Certified Workforce Development Coach (CWDC) designation, which involves a similar curriculum and testing process. The first certification is the Certified Career Management Coach (CCMC), which is a rigorous 3-month training program including studies, examinations, and live coaching evaluation covering a wide range of topics. The CCA’s second credential offering is the Certified Job Search Strategist (CJSS), in which coaches learn how to facilitate their clients’ success through job search strategy design and job seeker evaluation tactics. Coaches also learn online search strategies and tools, network fundamentals, interviewing concepts, and more. This organization offers Job & Career Transition Coach (JCTC) and Job & Career Development Coach (JCDC) credentials. Each credential is achieved by completing 3-day, hands-on workshops. To achieve this organization’s CCM designation, career professionals must already hold a Master’s Degree or higher, previous certifications in the field, published articles, previous CEUs, public speaking experience, volunteer experience, and more. This organization offers a variety of certifications, including Life Purpose & Career Coach (LPCC), Certified Life Coach (CLC), and Certified Coach (CC). All programs involve a series of weekly teleclasses followed by nine to 12 practice sessions with real clients and an oral examination. Reach Communications offers a Personal Branding Program certification (Certified Personal Branding Strategist – CPBS). This patented program teaches coaches how to provide custom, innovative career management strategies for their clients. The WCI offers the ICF-approved Certified Career Coach (CCC) designation, which includes career assessment, networking, interviewing, communication skills, career advancement, transformational coaching, and other training areas.